In Zen Guitar, the author talks about finding the silence between the notes. Even when playing a reel full stop, Gráinne Hambly, exhibits such poise, authority and skill that every note has its moment giving her music a depth that is hard to describe. Velvet wrapped around steel, might get close! Her style of playing and her accompaniments while firmly traditional, incorporate and celebrate contemporary rhythms with amazing dexterity and flawless taste. Her accomplishments are many. She is popular in many countries and she tours around the world, has three solo CDs, two music books and two CDs with William Jackson. With a master's degree from Queens University in Belfast and years of workshop experience, her teaching skills match her playing; she is patient, clear, and sharp-eyed. She teaches at most of the major summer schools in Ireland and is in much demand here when she's on tour. She was also on staff at You Gotta Have Harp's Harpers' Escape Weekend for 16 years. 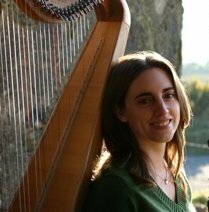 This year she is heading our Harpers' Escape at Somerset Sunday program and following the festival she will be one of the guest musicians on the Harp Tour of Ireland from July 30-August 9. For the advancing student, eager to take on challenges, (warning: she makes it look easy!) Gráinne is a great choice. For more than 30 years Janet Harbison has been a leading exponent of traditional music on the harp. She’s enjoyed a career of performing, composing (including for films) and held various academic positions including a Doctoral Research Fellowship at Queen’s University Belfast. In 1986, she moved to work with the Dept of Education (Belfast) creating projects toward Peace and Reconciliation for which she received a number of awards including an honorary doctorate from Ulster University. Her most visible project was the founding of the Belfast Harp Orchestra in 1992, which, for 10 years, toured all over the world including with the Chieftains with whom they won a Grammy award for the album The Celtic Harp. 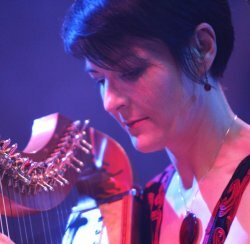 She founded and ran the Irish Harp Centre in Limerick from 2002 to 2016, when she took up the appointment of Visiting Professor at Ulster University in Derry, Northern Ireland. The Belfast Harp Orchesta was renamed the Irish Harp Orchestra and continues to tour annually. Her huge repertoire of arrangements and her own composed works, published CDs and books are way too numerous to mention here. This is her second appearance at Somerset. Shyamali Roy Hauth ((Yoga Alliance ERYT) is the founder of Mahari Yoga, a yoga & meditation school located in Reston, Virginia, with a secondary branch in Southern Illinois. She teaches Hatha yoga and meditation as well as trains the next generation of yoga teachers. 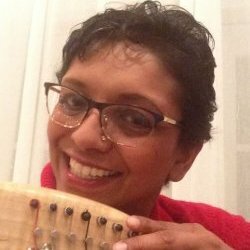 She has worked with a variety of musicians and dancers and has developed yoga techniques to enhance their performance as well as reduce chronic use stress. Born in India, she learned from Guru Pankaj Charan Das, and later was certified in the Himalayan Institute tradition through Omaha Yoga and Body Work Center. She has a Masters in Human Resource Management and spent 10 years on active duty in the US Air Force. As with all our presenters she has a harp connection, of course! Shyamali began playing harp late in life, when she and her child both took lessons with Kathy DeAngelo, now festival director. We welcome Deborah back to our faculty to challenge you to boldly go where no harper has gone before. 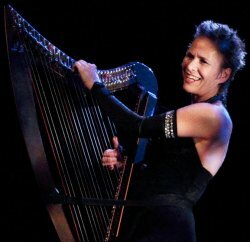 Since one reviewer called her the ‘wild woman of the harp,’ Deborah describes herself as being "cross-genre: jazz-pop-comedy-blues-flamenco-celtic.” During her impressive career which includes a CD that was nominated for a Grammy, Deborah has brought the harp out of the demure background and into the electric limelight! Mixing music and theatre Deborah performs solo or with a symphony with equal ease. When orchestrating her own music, she often engages symphonic musicians in unexpected ways. Writes another reviewer “her life, her shows, her instrument, her workshops, and her music are all about transformation.”As before, Deborah will be presenting an additional all-day Sunday program, which have been so well received, that we've come up with a new program to help extend your weekend at the festival. She'll do four workshops for us and then present her own special Sunday Instant Harp Ensemble as an add-on. Corrina's appearance is sponsored by Camac Harps. Corrina was born in Edinburgh and raised in the Scottish Highlands, which have given her a passion for traditional Scottish. From an early age she was taught piano and fiddle before taking up the harp at the age of 13. Having studied music at the Royal Scottish Academy of Music & Drama in Glasgow and then attending the City of Leeds College of Music, she broadened her horizons to jazz & contemporary music. She has an incredible voice which can be traditional and then easily move into jazz and then contemporary nuances. All of this musicianship follows into her work as a composer, arranger and musical director. Corrina has earned an enviable reputation as one of Scotland’s most creative writers and band leaders. She coordinates the award-winning Celtic Connections Festival series of public workshops each year and also leads Harmony Singing workshops across the UK. As well as being a prolific tunesmith and songwriter, she has worked with 350-piece choirs and, has 14 large-scale commissions to her name. She has an impressive 11 CDs to her credit, some solo, some with her bands The Unusual Suspects and Bachue, and the Dunedin Consort performing her Silhouette suite. She will be releasing a new book at Somerset, specifically done for our harp community. Ann is also presenting at the Historical Harp Society Conference on Sunday. 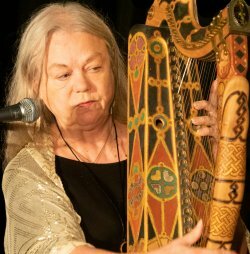 When Ann Heymann first drew her finger across the wire strings of a Jay Witcher harp over 40 years ago, she was immediately enchanted by its silvery sound and intrigued by the long-forgotten pedigree of the Gaelic harp. She embarked on a quest to uncover its history and revive the playing of the instrument and has become a world-reknown expert on the wire-strung harp and its music. Being a pioneer meant she has a lot of "firsts" to her credit: developing fingernail and damping techniques from the ancient Robert ap Huw harp manuscript, adapting highly ornamented piping variations to the clairseach, interpreting and performing repertoire from several ancient harp manuscripts, creating the clairseach style in the performance of Gaelic poetry. Her music books and tutors in the wirestrung or Gaelic harp are must-haves for any aspiring player of the instrument. She is bringing a number of her historical harp recreations to Somerset as well as her husband, Charlie, who will accompany her on accordion in her concert performance. We're delighted to have Nancy back at the festival this year. 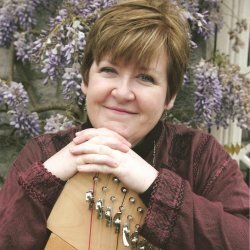 Although Nancy Hurrell is proficient in a wide variety of musical genres from classical and popular, to Celtic and early music, it is her expertise and devotion to the study of historical harps that is a distinguishing feature of her impressive career. 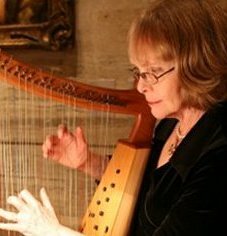 Nancy is fully engaged in the historical harp world with major stint as the harp consultant for the Museum of Fine Arts in Boston, where she gives gallery talks and performs on rare historical harps in the collection. A member of the board of the Historical Harp Society, she teaches Renaissance harp at Brandeis University. She's been the guest curator for ‘The Harp’, a major exhibition at MoMM in California. As an expert on Egan Irish harps, Nancy has lectured at the Royal Irish Academy in Dublin, which got her an enviable personal invitation to see the historic harps now in storage at the National Museum in Dublin. She has a new book, The Egan Irish Harps, on which she will base her presentation at the Historical Harp Society's conference on Sunday. She regularly publishes articles in History Ireland magazine. She performs in several Boston early music ensembles and recently played medieval harp in Hildegard’s 12th century play, Ordo Virtutum. Her CD Baletto, features early dance music, and a new ensemble recording is Turlough O’Carolan-A Life in Song. Nancy has 5 books of arrangements, including her Historical Harp Collections of early music. Take advantage of her expertise while you're here at Somerset. Simply listing William Jackson’s achievements, as musician, performer and composer can’t come close to capturing the brilliant spirit, musical intelligence, dry wit, and sympathy that he brings to every instrument he plays, piece he composes and class he teaches. Although the harp is his primary instrument, Billy’s knowledge and experience allows him to move comfortably from the bouzouki to the tin whistle. In 1976 he was a founding member of Ossian, a breakthrough Scottish band. His richly woven and bold compositions, The Wellpark Suite, St. Mungo, Inchcolm, and A Scottish Island, reveal him as a master of orchestration with a sensitivity to contemporary tastes and the traditional idiom. In 1999 his composition 'Corryvreckan' from the album Inchcolm was included on Fiona Ritchie's favourites collection, "The Best of The Thistle & Shamrock, Volume 1." More recently he composed “Fantasia on Scottish Themes” for the Asheville Symphony Orchestra” in North Carolina. He is now living in Ireland. His 2009 CD with Grainne Hambly debuted at Somerset. 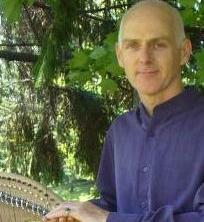 Besides many CDs he also has one book, Scottish Traditional Music, complementary to the CD The Ancient Harp of Scotland. He was on staff at You Gotta Have Harp's Harpers' Escape Weekend for eight years and this year is leading our Harpers' Escape at Somserset on Sunday. He was recognized with Somerset's Lifetime Achievement Award in 2016. Liza has studied harp maintenance and mechanics privately under the tutelage of master harp builders Pat Dougal and John Pratt. She has worked out in California with Triplett Harps and is a warranty repair service for their company. 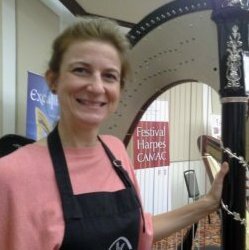 She is the only American woman to be invited by Jakez Francois, president of Camac Harps, the most innovative harp manufacturer in the world, to become a warranty repair service for their company. When she's not working in her studio in New York City, Liza is globetrotting on her harp maintenance missions and has been all over the world.